Juan Sorto volunteers to feed the homeless during his spare time. 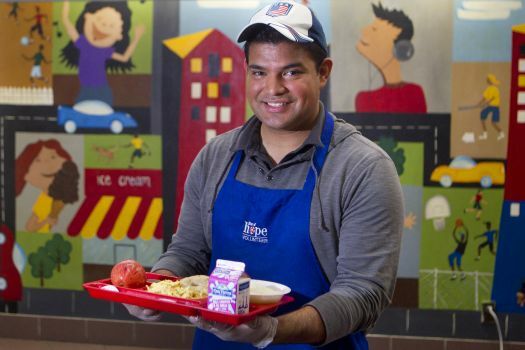 Juan Antonio Sorto, nominated by Houston Chronicle reader Jessica Fuentes for Houstonian of the Year, made headlines earlier this year when he signed up for volunteer work feeding the homeless while visiting Washington, D.C., in January to attend his first presidential inauguration. If you know Juan, she wrote, that would not have been a surprise. He's been volunteering to help the less fortunate since he was in high school. The drive to help those in need was instilled in him early on from the simple realization that, for those with motivation and, particularly, opportunity, a good life was within reach. "His passion has been to serve others," Fuentes wrote. For instance, for the past six years, the 28-year-old has volunteered weekly at the Star of Hope's Women and Family Emergency Shelter, serving breakfast. Hunger relief efforts resonate with him because he experienced extreme poverty as a young child. As Chronicle reporter Cindy George reported in January, Sorto is a native Texan who was born in Dallas. His mother returned to her native El Salvador when he was a toddler to raise her son with more family support. With the country's civil war raging, they moved away from her hometown, and poverty - and hunger - set in. His mother returned to the United States in 1991 and sent for Sorto the next year. He described to George having to learn English and then later, "barely" graduating from high school. "When I left El Salvador in 1992," he told George, "pretty much my life was already changed and something inside of me said that it was pretty much my duty to help the lower-income community." Fuentes wrote that while working full-time as a Harris County probation officer and taking classes to finish a doctoral degree in community development at Texas Southern University, Sorto also finds time to mentor second-grade and ninth-grade students in the schools that formerly were part of North Forest ISD. And he's "adopted" several Metro bus stops and spearheaded several community cleanup events in his East Houston neighborhood, earning mayoral honors this year for the work he led along with the East Houston Civic Club and TSU. Today, he and some friends will take his service mission to his childhood home of Linia, El Salvador, where he will distribute new and used toys that he has collected. It's a heart of service, and it's one rooted in the path he has carved in Houston. "I look at where I am now in my life," Sorto said. "I feel it's my duty to help others, to show that you can be somebody and do something good despite your circumstances." Sorto graduated from UHD with a degree in criminal justice. He currently works at Harris County Community Supervision and Corrections Department, where in 2009 he received the Service Above & Beyond Requirements Award for his excellent team and leadership skills and became an active member of the Texas Probation Association. Sorto is now pursuing a Doctorate of Philosophy in Urban Planning form the Barbara Jordan-Mickey Leland School of Public Affairs at Texas Southern University.